The branch, which started trading on the 14th May, makes more than 10,000 building products immediately available for contractors and installers working in the area. To celebrate the opening it will be running some exciting introductory offers on a range of products. These include low prices on a number of best selling products from the Roofline range, rainwater systems, window boards and finishing trims. There are also some great deals on fixings and sealants to be had. Details can be found in-branch and these introductory offers will be running for three months. 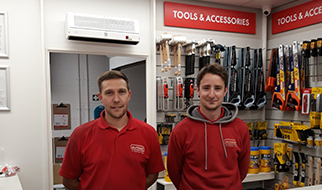 Branch Manager, Dean Pemberton, and Branch Sales Manager, Jonathan Ryan, bring a wealth of experience to the team and look forward to offering a first class service to local tradesmen. Pictured from left to right: Clayton (Trade Counter Assistant), Dean Pemberton (Branch Manager).